Bake No Name® Tilapia according to package directions. Assemble the following ingredients: shredded cheddar and Monterey Jack cheese, bok choy, cilantro, diced tomatoes, diced cucumber, shredded lettuce, lime, sour cream, salsa & small flour tortillas. Place a small amount of vegetable oil in a sauté pan. Place one tortilla in the pan. Place a little of the tilapia on one half of the tortilla. Top with cheese, bok choy, cilantro, tomatoes & cucumber. Fold the empty side of the tortilla over the top of the filling ingredients. Cook until the tortilla is lightly browned on one side. Turn the taco over and brown on the other side. Make the lime sour cream – add approximately 1 Tbls. of fresh lime juice and 1 tsp. of lime zest to approximately 1 cup of sour cream. 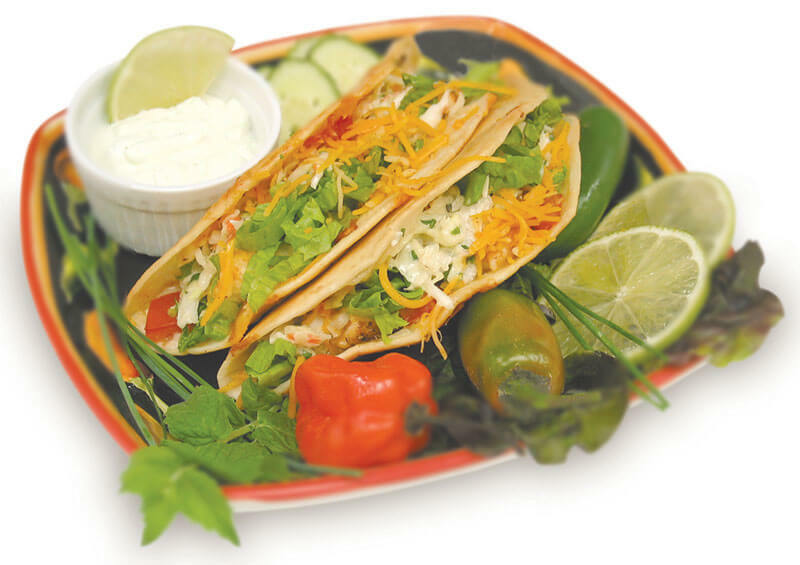 Remove the taco from the pan; add your shredded lettuce, lime sour cream & salsa to the taco. Continue to fry tacos using this method. Serve.